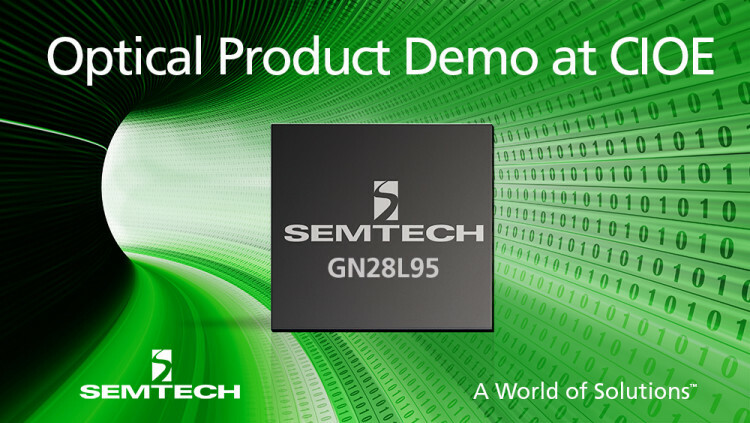 Semtech Corporation (Nasdaq: SMTC), a leading supplier of analog and mixed-signal semiconductors, today announced the release of the GN28L95 integrated laser driver and limiting amplifier for asymmetric 10 gigabit PON applications, combining for the first time Semtech’s unique automatic laser calibration technology with programmable 2.5 gigabit transmit and 10 gigabit receive signal paths. The 10G PON market is expected to benefit from the ongoing roll-out of fiber-to-the-home (FTTH) network deployments where PON delivers economical Internet connectivity. Semtech is showcasing its optical products at the China International Optoelectronic Expo (CIOE) in Shenzhen, booth 1C01, on September 6-9. This technology helps achieve cost reduction in the optical networking unit (ONU) in fiber-to-the-home customer premises equipment by enabling optics to be mounted directly on the main ONU board. This helps manufacturers keep pace with the rapid global growth and cost competition in the market for next-generation high data rate XGPON and 10GEPON ONUs. The GN28L95 is available in a small 4x4 millimeter QFN package, and it is compatible with a wide range of low-cost optics and requires minimal setup time with high production yield. Low-cost lasers and avalanche photodiodes (APDs) can be optimized using unique eye shaping technology to both transmit and receive. Further cost savings can be expected to be achieved through integration of the APD controller and digital control directly with the MAC processor. To optimize layout and minimize cost, the part is available in a small 4x4 millimeter QFN package. The GN28L95 product announcement coincides with the China International Optoelectronic Expo (CIOE) in Shenzhen September 6-9 where Semtech is demonstrating its optical products in booth 1C01. All statements contained herein that are not statements of historical fact, including statements that use the words “helps achieve,” “enabling,” “can be expected” or other similar words or expressions, that describe Semtech Corporation’s or its management’s future plans, objectives or goals are “forward-looking statements” and are made pursuant to the Safe-Harbor provisions of the Private Securities Litigation Reform Act of 1995, as amended. Such forward-looking statements involve known and unknown risks, uncertainties and other factors that could cause the actual results of Semtech Corporation to be materially different from the historical results and/or from any future results or outcomes expressed or implied by such forward-looking statements. Such factors are further addressed in Semtech Corporation’s annual and quarterly reports, and in other documents or reports, filed with the Securities and Exchange Commission (www.sec.gov) including, without limitation, information under the captions “Management's Discussion and Analysis of Financial Condition and Results of Operations” and “Risk Factors”. Semtech Corporation assumes no obligation to update any forward-looking statements in order to reflect events or circumstances that may arise after the date of this release, except as required by law.